Flanking has been a strategy that has worked beautifully so far for Mahindra. When it first launched the Scorpio, it didn’t position it as an SUV, but as an alternative to C-segment cars. It repeated the same strategy with the XUV5oo, except that it brought potential premium MPV and D-segment buyers into its fold. This time, its target is the entry C-segment buyer and the premium B-segment buyer with a product called the Quanto. Quantum leap, then? Pretty much. 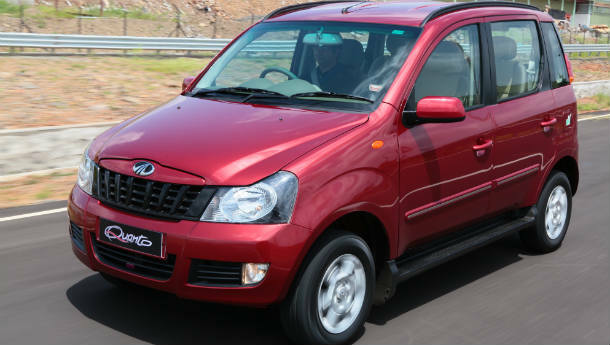 Mahindra has always wanted to derive more from the Xylo platform, but it hasn’t managed to do so. It’s been stuck in the 2000-3000 units a month range since day one and hasn’t made any progress on that front. Okay, so the Genio pickup derives some genes from the Xylo, but that’s about it. What better, then, than to take the Xylo, re-engineer it and offer it to a slightly different buyer? 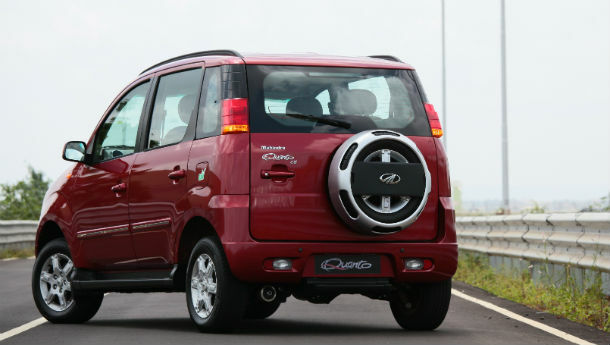 The Quanto is Mahindra’s first true-blue attempt at going right after 70 per cent of the car market – hatchbacks. This is as much a new strategy as it is a stop gap, with Mahindra working furiously at various sub 4-metre offerings (turn to page 32 to read our exclusive story on Mahindra’s future cars). At first glance, the Quanto isn’t your average MPV, what with its abruptly cut out rear section and the spare wheel on the tailgate. It isn’t an SUV either, even though it’s still rear-wheel driven and has an impressive-by-hatchback-standards 180 mm ground clearance. It’s a cross between the two and honestly quite a challenge for me to put it in words. And while it does take on hatches, it doesn’t have an upward opening hatch. The Quanto is a strange animal then, but it isn’t bad looking. The 15-inch wheels do look a little small here, but that’s also because the profile of the tyres is lower than the Xylo. The tail lamps are neatly stacked into the D-pillar, while the rest of the car, till the C-pillar, looks no different than the Xylo. The shortened tail has also meant the use of a new tailgate and were it not for the spare wheel, it’d look slab-sided and drab. You do get a new roof with lesser stiffeners, while new reflectors and rear-step complete the package. The rest of the package is still the same. It’s the same body-on-ladder chassis with rear-wheel drive, identical drive axles and front suspension componentry. In fact, the only changes to the suspension are the addition of dampers to the rear multi-link setup, something not present in the Xylo. The suspension has been re-tuned to handle the new weight and new dimensions as well as motor behaviour, while a new electric fan instead of a viscous fan for the air-conditioning is designed to make the package more efficient. 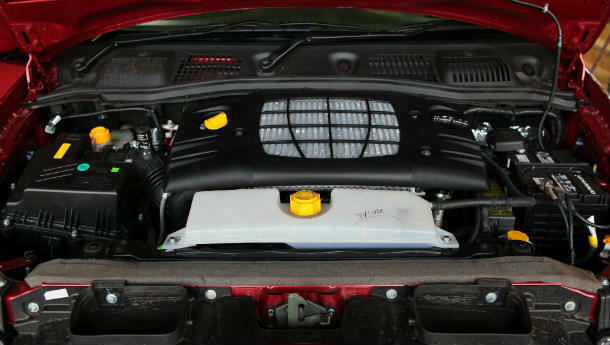 The biggest difference between the Xylo and Quanto, apart from the length, is what’s under the hood. A new, longitudinally mounted 1.5-litre, three-cylinder turbocharged diesel helps the Quanto meet the lowest excise band for cars. This engine does trace some of its antecedents back to the 2.2 mHawk and has a different bore and stroke setup. But for Mahindra, or an Indian OE for that matter, the big leap is in the turbocharging area. It uses a Borg Warner twin-scroll turbocharger, a first for an OE from our country. The only other manufacturer that offers twin-scroll turbochargers on cars sold in India is BMW, and that too for some of its more premium models. It has an aluminium head with double overhead camshafts and a Bosch-developed fuel injection system. The setup has resulted in a power output of 100 bhp at 3750 rpm and a torque figure of 24.4 kgm from 1600 rpm to 2800 rpm. Since this is a three-cylinder engine, Mahindra engineers have worked considerably to reduce NVH levels by using a whole set of sound dampeners and what have you. On paper, these figures may sound like a lot, but in reality, things are a bit different. On start-up, you are greeted by a pretty refined three-pot. In fact, apart from the faint whine of the engine, there is little to tell that it is a three-cylinder unit. Engage first, let go of the light clutch, and you may find progress a little dull, till about 2,000 rpm, and then the car starts to find its sweet spot. With peak power coming in at 3,750 rpm, this isn’t exactly a rev-happy engine. Progress is brisk, but not exciting if you were expecting that. The 5-speed gearbox is a revised unit of the one found on the Xylo and it is reasonably slick, but no earth shaker. The achievement for Mahindra engineers however, lies elsewhere – driveability is good. Gear ratios are well selected and the torque delivery at mid revs is linear. What you have here is a car that’s great in the city and cruising on highway roads, not going flat out, which has also been the case with the Xylo. And the NVH levels are significantly good, something M&M should indeed be proud of. While the wheelbase remains the same, the change in weight distribution and other factors has meant re-tuning the suspension. Mahindra has also adopted 205/65 R15 tyres, which are a significantly lower profile than the 215/75 R15s on the regular Xylo. This has helped in reducing some of the pitch and dive of the Xylo and made it a wee bit nimbler, with decent grip on offer. The downside is that on flat, straight stretches of road, it does continue to feel a bit bouncy. Since this was a drive on Mahindra’s own test track, we shall reserve final comment for our full blown test. On the inside, the mini-Xylo pretty much resembles its larger cousin. With the exception of the Scorpio-derived steering boss and the addition of a Start-Stop function, pretty much everything else is identical. With four trims on offer, the Quanto comes with airbags and ABS as standard on the C8 trim, which you see on these pages. The captain chairs for the front have been retained, while the ergonomics and quality of fit and finish is barely different from the Xylo, which is mostly acceptable, but needs improvement in some areas. The second row uses a narrower seat squab and backrest that’s been designed to fit the third row of jump seats. The seat is rather upright and too hard and can be a bit uncomfortable on short journeys. Legroom is still good, though. If you must use the side-facing jump seats that replace the third row, you will find that two mid-sized adults can be comfortable on short journeys, except that there are no seatbelts for them. 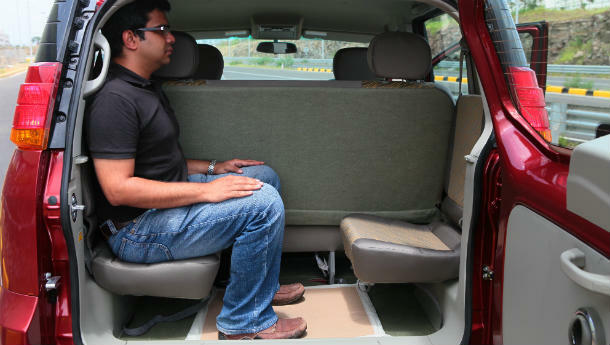 Essentially, the use of these jump seats gives Mahindra certain tax benefits and allows them to go for a slightly different emission rating, but honestly, you are better off using those seats for emergency purposes only. With the seats folded in place, the boot is large enough to carry luggage for a family of five for about a week, practicality that won’t go unnoticed. The Quanto comes priced at Rs 5.82 lakh for the C2 variant, Rs 6.35 lakh for the C4 variant, Rs 6.86 lakh for the C6 variant and Rs 7.36 lakh for the top-end C8 variant. And this means Mahindra’s flanking strategy may just work once again. As a car, the Quanto finds itself in a unique position, the Premier Rio probably coming closest in design and character. 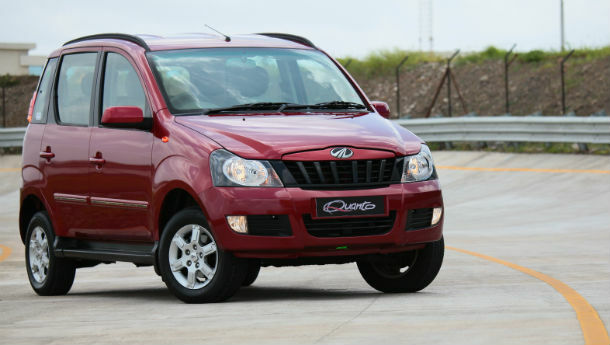 But the Quanto will enjoy Mahindra’s presence and brand pull, which could help it against the well-established lot. The competition will certainly be wondering which product of theirs Mahindra will flank next.